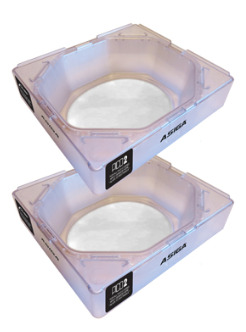 These are the new Asiga seamless build trays that will fit all Pico Plus and Pico2 and Pico2HD model machines. On Legacy Pico Plus machines these trays will require either a small modification of your existing handles/clamps or we have new stainless handles available for only $25 per set. The modification or change out can be done in under 30 minutes. We provide instructions if you choose to do the modification.